We recently purchased a family zoo pass which allows us free or discounted admission to zoos throughout the country. 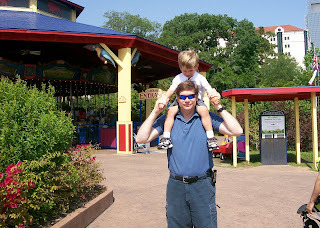 We decided to use our pass a few days ago at the Houston Zoo. Dawson really enjoys visiting zoos, although he doesn't take the time to sit and ponder the beauty of the animals. If they aren't engaging in some fascinating activity, he'll look at them briefly and then speed on to another exhibit. 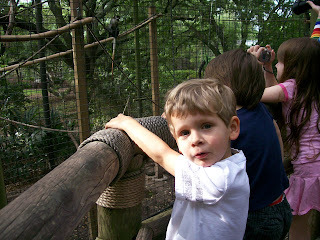 Of course, his favorite attractions are the children's zoo areas and the Houston Zoo has an excellent children's zoo. Here are a few pictures from our recent zoo excursion. 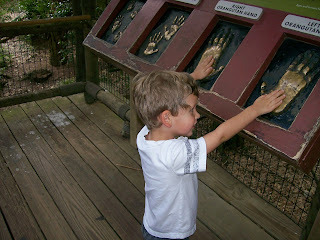 Checking out the primate handprints. Asking us what the monkeys are saying. He very interested in what other people, animals, and objects are saying/thinking. 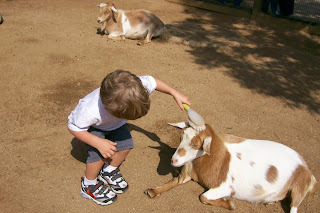 Gently brushing the goat at the petting zoo. 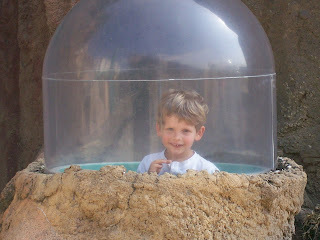 Peeking through the pop-up dome in the prairie dog exhibit, which gave him an up-close look at the prairie dogs. This was probably his favorite attraction at the zoo. 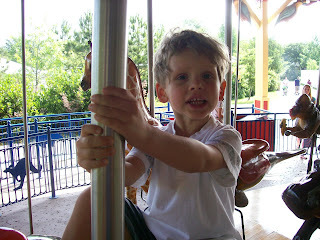 Riding the carousel at the children's zoo. 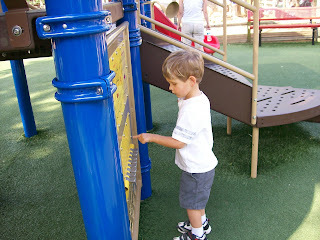 Playing music at the playground. As with other times we visited the Houston zoo, he was very enamored with this musical instrument and spent a lot of time making music. 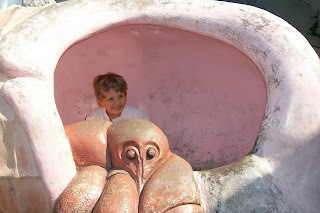 Hanging out in a giant shell with the giant hermit crab. Riding up high on Dad's shoulders.